With battery storage solutions for your energy you have a wide range of advantages: Whether it is for an emergency power supplier, to increase the usage of your own produced energy, or as an Off-Grid solution or to compence peak loads. As qualified partners, we can fully consult you in matters of battery storage solutions, efficency and implementing such projects. In terms of planning, we develop with your assistance the best solution meeting your requirements. With our extensive Know-How and reliable competence, we are the right partner for all your questions, from the type and size of the system, to the optimal location and the feasibility of the project. No matter where we are needed around the world, we are always there to deliver our “Made in Germany” quality and to offer our much respected and reliable service with the help of our skill sets and experienced staff at our engineering office, also with tailored custom solutions. With our internal employees we can take care of the whole process of execution on-site: With our personal construction manangement, qualified installors and specialist electricians we build the system from scratch and make sure the installation is seamless and trouble-free. You can also count on us internationally: Whether you need construction management for a 66 MW system in Jordan or a special solution sanitation for a system in England. With the help of our construction managers and skilled workers we were able to execute and finalize past projects to the full satisfacttion of our customers, who are always delighted to recommend us. 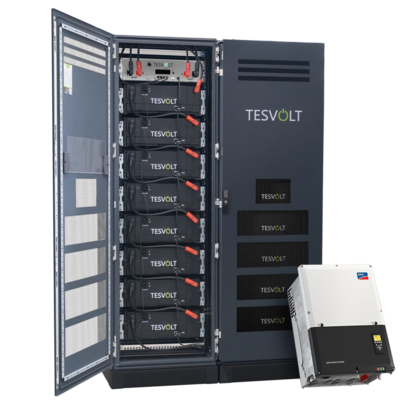 As a premium partner of TESVOLT we deliver world wide qualified solutions for highly efficient batttery storage solutions. 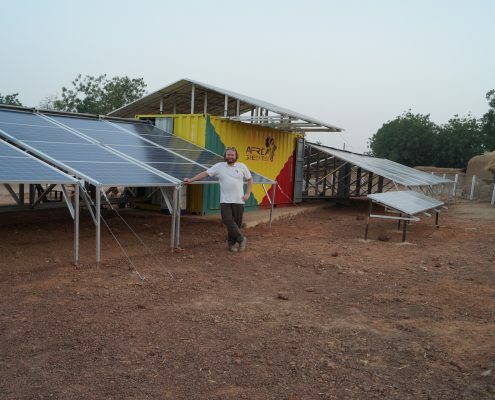 This image depicts as an example the TPS energy storage as a container solution: high efficiency, low costs and practical form. 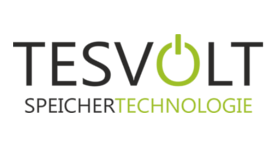 Furthermore, we offer module solutions, that can be individually extended. An example of that is the picture shown on the left side, and this can be expanded according to your wishes. Because we, ACHE Engineering GmbH, developed and designed the racks as well as produce them, we are the best to be trusted with the system. The racks are highly stable, comply with the newest technical requirements and are specially designed for battery storage solutions. 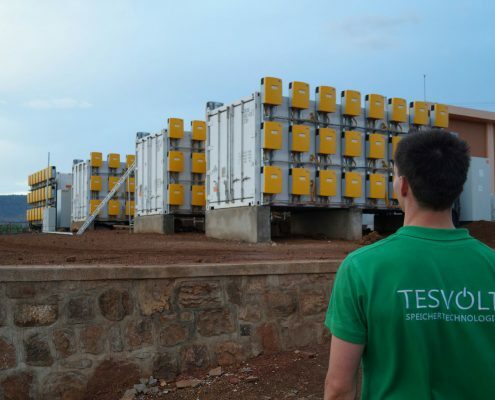 Together with TESVOLT we are, also internationally, your suitable partner for battery storage solutions: Whether it is for the World Expo in Kazakhstan, for the water supply in Ruanda or even for the clean electricity supply for a quarter million people in Mali.